Project AWARE® is a global movement for ocean protection powered by a community of adventurers. They connect the passion for ocean adventure with the purpose of marine conservation. Project AWARE is Oceanographic’s primary donation beneficiary. Crew Clothing Company was born in the back of a windsurfing shop in Salcombe in the 1990s. It has maintained its connection with the sea ever since and is now the go-to British lifestyle brand for a smart, casual wardrobe. 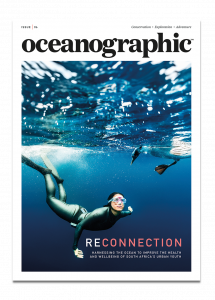 Crew is Oceanographic’s principal stockist. Selected stores. Blue Sphere Foundation works to safeguard the planet’s ocean, halting the destruction of threatened marine species and habitats. They go where there are urgent threats and resource gaps, acting quickly to establish the necessary groundwork for others to join in. BSF is a donation beneficiary. Wildcoast is a California-based charity working to protect local and international coastlines, including stretches in the US, Mexico and Cuba. Campaigns range from initiatives to save surf breaks to the creation of marine reserves. Wildcoast is a donation beneficiary. One World One Ocean's mission is to raise awareness of ocean degradation. Their IMAX movies show how amazing the ocean can be in its healthy, wild state. Their aim is to spark a global conservation movement, by showing people just how much we stand to save, if we stand for the ocean. Britain’s biggest surf apparel brand has been a mainstay of the UK surfing scene for decades. Created by two surf-mad brothers back in the 1980s, the brand has remained true to its roots - and the ocean - ever since. Saltrock is a digital partner of Oceanographic.